SUSPICIONS are that London mayor Boris Johnson would have rescued a woman under attack from an armed group of young girls has he been able to think of what to shout at them sooner. Boris’s initial reaction was to yell “FU**ING ADA”, followed by “C****S!” But to do so would be unbecoming to his stranding as a likeable toff. 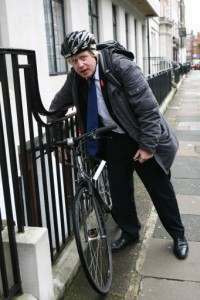 As Boris thinks, Franny Armstrong is surrounded in Camden, north London. A girl pushes her. Another girl has an iron bar. Others have hoods. And all the while Boris is thinking. “RAPSCALLIONS!” Too long-winded, and possessed of anti-rap music undertones. “SCALLYWAGS!” Liverpool hates him enough, so it might be worth a try. Armstrong is the founder of the 10:10 campaign, which aims to cut 10% of carbon emissions in 2010 and has attracted support from leading firms – including the Guardian – and personalities. Armstrong, who helmed recent climate change documentary The Age Of Stupid. Surprise she wasn’t on a plane like her film’s fans. But Never fear, fair maiden. Here’s Boris. These toughs stand no chance when confronted with chubby man on a push bike who understands the power of language. Hoodies are done for. Chavs are out. Oiks are very much in vogue. 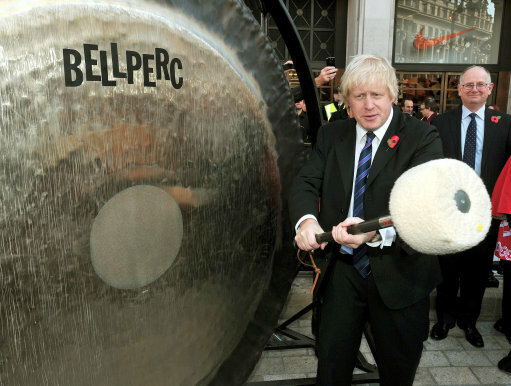 The Mayor of London Boris Johnson strikes a giant gong to signal the opening of the new diagonal pedestrian crossing at Oxford Circus in London's West End.